I was left feeling like Muhammad Ali had his way with me. The monkey on my back was rolling around while laughing hysterically. to land a Virginia citation red drum! 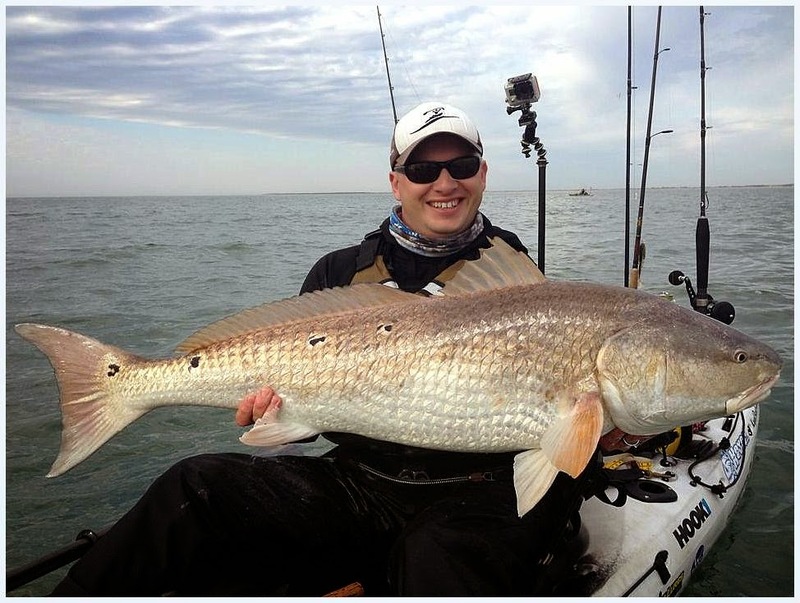 As the calendar turned into 2014, so did my outlook for the upcoming spring bull red season at Virginia's Eastern Shore. I knew that going into the spring season with a negative mindset would be mentally defeating before I even had the opportunity to get back on the horse. I would be damned it I was going to let that happen! I kept telling myself, "It's a new year. You WILL catch your citation!" Positive vibes were also sent from the local red drum veterans. They knew I busted my tail last year and they knew I was bound and determined to kick that monkey off my back. Joe Underwood, William Ragulsky, and I hit the Eastern Shore locked and loaded to do battle with the spring beasts. Without any confirmed catches by a kayaker and only a rumor about a couple boats landing a drum, our expectations were not crazy high. While cruising the backside of the shoals, 4 dolphins decided to join us off to my starboard side. As I looked towards my port side, I noticed something a little different in the water about 50 feet away. "Ah, what the hell, let's take a cast at it..."
Bzzzzzzzzz...splash...."let the swimbait sink for a second, engage the reel, turn the handle while...BAM!!! My mind took over and it was showtime! 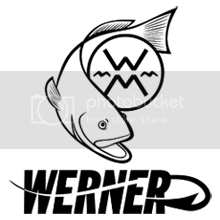 The violent headshakes with insanely fast runs told me right away that this was a big red drum. The huge black-dotted tail throwing water around confirmed that I was doing battle with the elusive enemy. I rehearsed this scene hundreds of times in my head, I WAS READY! Now, the moment of truth! I knew it was going to be close. I finally have my Virginia citation red drum! 9 trips and around 100 hours were spent chasing bull reds of the Eastern Shore in 2013. Hundreds of dollars in food, tolls, parking fees, gas, gear, etc. All of that means nothing now. This year, it took 1 trip and less than 2 hours to kick the proverbial monkey square in the gonads to send him sailing off of my back. "Hey Monkey, you're time here is up. HIT THE BRICKS!" 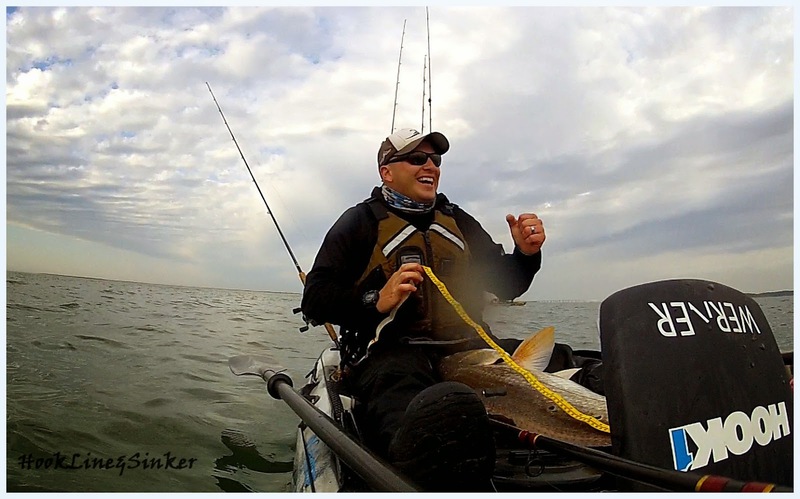 It's been said by the veteran kayak anglers that paved the way at the Eastern Shore, that once you put in your time and pay your dues, the reward is even sweeter. Congrats Richie!! A well deserved citation!! MAN! Congratulations Richie!!! That was one nice Red!!! Congrats Richie, your smile in the last picture tells it all.